USA Roller Chain and Sprockets is a premier supplier of high quality Made In The USA chain tools and other accessories. We also have a full line of premium quality roller chains, sprockets, bearings, electric motors, reducers, belting, and much more! We strive to provide the best customer service, value, and offer an extensive inventory. 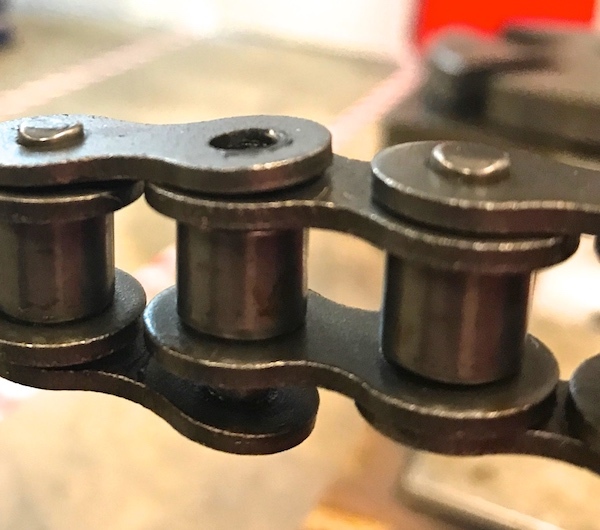 All of the chain breakers below are manufactured out of premium heat treated tool grade steel, and will break multi strand roller chains as well. 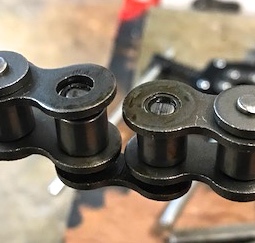 The smallest roller chain breaker that we have breaks ANSI sizes #25 - #60, ISO sizes 04B - 12B, double pitch sixes C2040 - C2060, as well as non-standard roller chains. The premium version of this chain breaker is manufactured in the USA and is notably different in durability when compared to the lesser expensive "import" chain breakers. We also include a free extra tip for those who are breaking chain on the daily. On up the line is the slightly larger roller chain breaker that will break ANSI sizes #60 - #100, ISO sizes 12B - 20B, and double pitch sizes C2060H - C2100H. 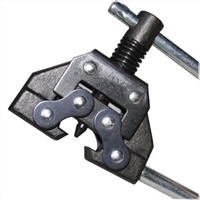 This chain breaker is supplied with an additional tip as well and it is manufactured in the USA. The largest roller chain breakers that we have will break ANSI sizes #120 - #160, ISO sizes 24B - 32B, and double pitch roller chain sizes C2120H - C2160H. 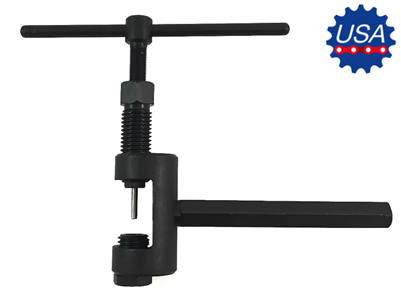 It is also manufactured in the USA out of premium tool grade steel and is defiantly the chain tool you want when breaking a large pitch roller chain. 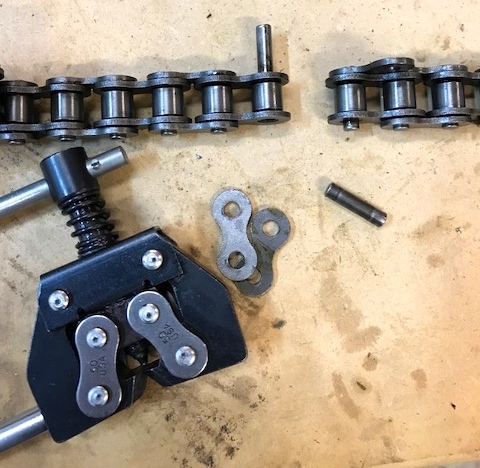 Additionally each and every part of this chain breaker is replaceable! So this means if anything happens to the breaker you can just replace one component instead of the entire chain breaker. We also offer a chain breaker that is a little larger than this one, it is called our CB4 chain breaker and will break ANSI sizes #160 - #240. It is the largest hand-held chain breaker in the world! 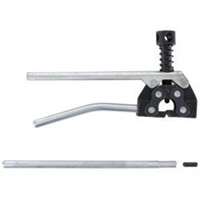 Now if you are looking for a roller chain breaker that will push the pin all the way through the chain and make a clean break we have that option as well. This breaker is manufactured in the UK out of premium heat-treated steel for maximum strength and durability. What makes these breakers so special besides the through pin design, is that they are able to break pintle chains; leaf chains; and other specialty chains that a traditional chain breaker couldn't do. There are similarly designed chain breakers on the market today at a cheaper price, but don't have the capabilities and durability that this one does. We sell these breakers to the typical Joe breaking chain, forklift repair shops, and roller chain manufactures. Besides chain breakers we are a one-stop shop for a wide verity of Power Transmission and Industrial Automotive components. We have a full scale quick reaction machine shop, an export department (se habla espanol), along with over 100+ years of industry experience amongst our sales and support staff. For more information please contact us, and for additional information about the machiene shop please click on the banner below.